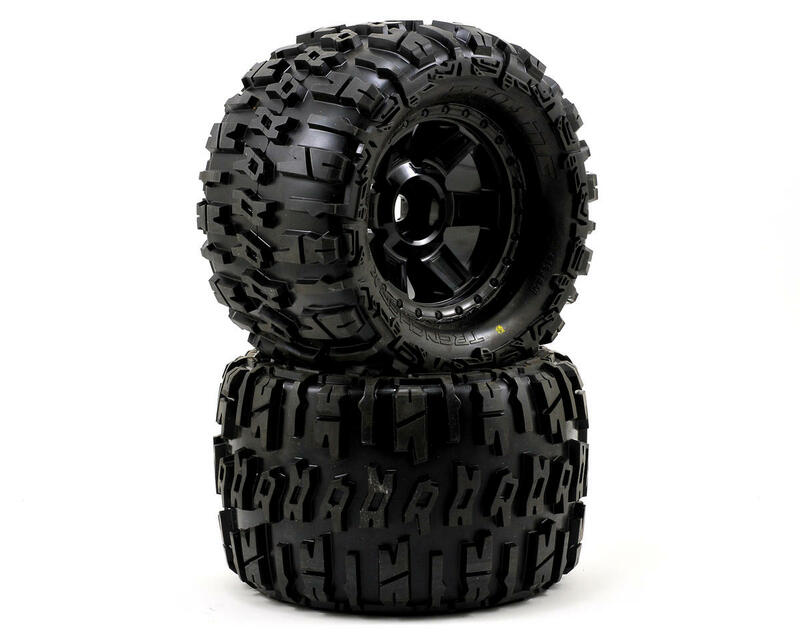 This is a set of two Pro-Line Trencher X 3.8" Tires, premounted on black Desperado 17mm Monster Truck Wheels. 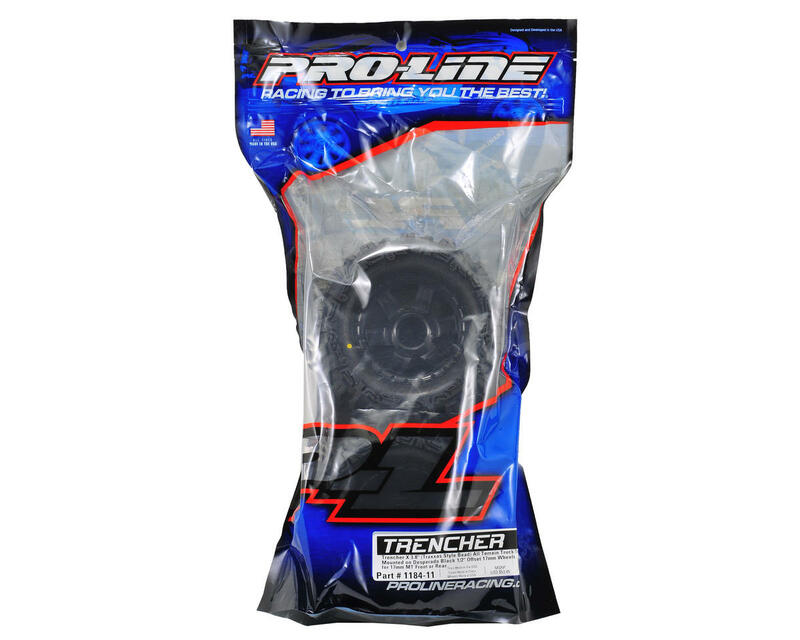 Leave a mark with your Monster Truck wherever you are with Pro-Line’s Trencher X tires. The Trencher X tires are designed to give your MT optimal traction on just about any surface. Super cool horizontal H shaped treads give your MT ridiculous amounts of forward bite. With tread height at ¼” tall, you’ll find that durability and longevity are second to none. These awesome Trencher X tires have been mounted on Pro-Line’s Desperado 6-spoke wheel, making your truck the toughest looking one on the block. The Desperado wheel is a one-piece glue wheel made out of extremely durable nylon material. The Desperado wheels feature a molded in bead-loc ring for an awesome scale look. Pro-Line has combined high strength nylon with a super smooth finish to give you the ultimate in wheel selection and style. This 17mm hex wheel and tire combo is sure to make your truck stand out from the rest, so get some today! Very high sidewalls, they absorb most of impact, so they are good for bashing/jumping. Rubber compound is kind of ideal for bashing, not too hard and wear of the tread is ok, nothing special. But before buying this wheels make sure your servo and steering linkages can handle it, i mean this wheels are HUGE and pretty heavy too. This wheel/tire combination is awesome on the Summit. These are much, much more durable than the stock Summit tires. Got a set on my T Maxx (liked the wide look) look real good. got that real off road tire sound on hard surfaces.